When I first started cooking I made biscuits all the time. I found them to be quick and satisfying to make as I could start a pot of soup, mix the dough for biscuits and quickly be enjoying fresh biscuits and homemade soup. I felt like a domestic goddess! In the last several years I have moved on to bigger and better culinary things, leaving biscuits in my wake. 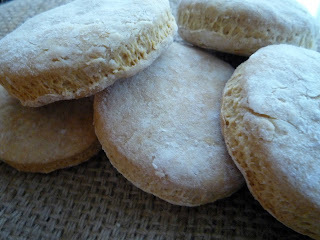 However, these Sourdough Biscuits (adapted from How it all Vegan!) may change that! They are flaky, moist and quick! I ate them slathered with butter and jam for supper. The original recipe called for margarine - which I don't usually keep in the house so I subbed it out for vegetable shortening which I always have. Also, my sourdough starter was unfed pretty much straight from the fridge, this meant that it wasn't as hydrated as it usually is, so I added about 1/4 of a cup of water to make the biscuit dough come together. Mix together flour, salt, baking soda and sugar. Cut in the shortening. Stir in the starter and water. Roll out and cut with biscuit cutter (or use the classic water class as a cutter!) Bake for 12-15 minutes at 350.